As they say, the past is prologue, and that is perhaps truer in tech than any other sector. How else can we explain how a deal to merge AT&T and Time Warner makes sense in 2016, when AOL's deal to buy that same media giant just a decade ago was considered such an unmitigated catastrophe? Brad Feld, founder of TechStars and the Foundry Group, describes the deal as a function of the cyclical nature of hype as a new technology takes hold. "The premise of the AOL acquisition and the premise of the AT&T acquisition 15 years later is the same: [It's] that you need to get this linkage between the content and the network layer," Feld said, speaking during a break at the Kauffman Fellows Reunion Summit in Kansas City this week. "That premise is still very valid." 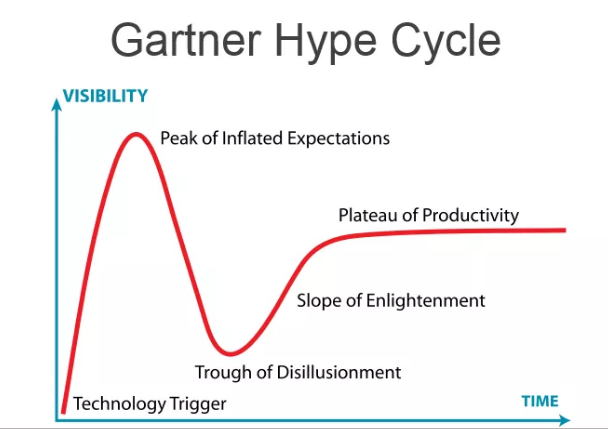 Feld pointed to a well-known Gartner chart that defines the anatomy of the hype cycle: A new technology creates inflated expectations, which then fall into a trough of disillusionment, only to slowly climb back to through enlightenment. Eventually, the technology lands in a more stable place: the plateau of productivity. When thinking about the AT&T / Time Warner merger, observers can only imagine what this will mean in terms of how we consume media: Will we even call the result "television" anymore? Will our kids have TVs in their living rooms? Form factors will continue to evolve, so we are likely to see a further fragmentation of content sources as the media world consolidates more and more. Increasingly, we consumers are the producers of our own channels for information and entertainment, as they are streamed, shared and captured in ever-smaller bites. Optimistic viewers might hope that this evolution in media will mean we become savvier consumers of information -- meaning a more positive impact on society. Related: Don't Want to End Up Like AOL and Time Warner? Here Are 4 Ways to Create a Winning Business Partnership. But perhaps we observers are getting caught up in the hype-cycle ourselves. Feld, who jokes that the only companies allowed to buy Time Warner are ones with three initials and names starting with a capital "A," likes to quote RebootHQ CEO Jerry Colonna, who's said: "We were right; we were just ten years too early." But, then, there have been lots of ideas that were 10 or 15 years too early. Watching TV on our computers is now commonplace, and is certainly one reason why the AT&T/Time Warner deal could succeed where the one with AOL failed. "We, with nostalgia and some pain and anxiety, recall the dot-com bubble, and many of those same ideas are being instantiated in products that are very successful today," Feld says, reminding a listener that, in technology, as in life, timing is everything.